I recently had the opportunity to do a presentation on cooking as a health strategy at the University of Minnesota in Morris. I wasn’t totally sure where Morris was. I knew there was cool stuff going on there, because I have met several folks who are changing the food system there, but I still wasn’t quite sure where it was. I left at 7 PM and drove Northwest in the end of a hot, hot Minnesota day. As I headed toward the setting sun, I saw gorgeous rolling hills, and could almost feel the sand in my feet as I went past lakeshore houses with docks and boats…who knew? I arrived at the home of my colleague, an organic beef farmer who runs the Morris Health Eating Project. People think I’m a busy woman-Mary Jo and her husband, Luverne manage 160 acres of beef and organic wheat and soybeans and a small patch of organic strawberries-this is when she is not running the healthy eating project at the University! When I arrived at 9:30 PM, she was returning from picking berries, and he had just finished cultivating half of the soybean field. Their house overlooks the gorgeous rolling hills of their farm-about as idyllic as anyone could imagine. She talked to me about the frustrations of trying to get organic certification for her small strawberry patch-one they had planted (with permission) along with organic canola and wool mulch. She showed me the 1/2 inch thick pile of paperwork she had to send in to prove the legitimacy of their growing methods-all to get $3 a quart at the local coop for possibly an hour of labor….Makes you wonder about this food system. Which is, of course, why I was in Morris. I spent the following day with a group of passionate, committed folks from throughout the region who are working in all kinds of ways to rebuild a sustainable food system in farm country-where industrial scale agriculture has taken over, and people are not quite sure how to get back to sustainable farming, or eating for that matter. I spoke to people about returning to the basics of cooking for our families, and we talked about the barriers and opportunities to change the eating habits of their community. Then, on this 97 degree day, I went to the farmer’s market on Main street, and did a cooking demonstration. Between the heat blaring up from the asphalt, and the flame of the gas burner, I was sweating on the inside! But the response of the crowd and the treat of showing folks how to make delicious, healthy food from scratch was worth the sweat! All in all it was an inspiring, and important day in this work toward bringing food back to our food system! 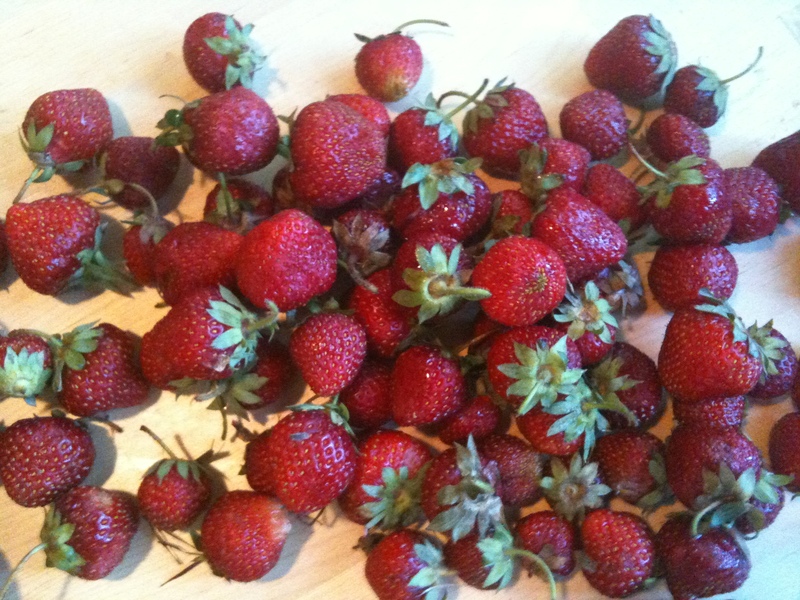 And the best part was that Mary Jo sent me off with 2 GALLONS of fresh picked organic (not certified of course) strawberries! Quinoa is a fantastic addition to the whole grain repertoire. Although it is an ancient grain, it has recently become popular in the natural foods community. It is highly nutritious—a complete protein by itself, cooks quickly—in about 18 minutes, and is incredibly versatile—delicious with beans, tofu, chicken, meat or fish, and with spicy, tangy, sweet or herby flavoring. The Family Kitchen: Kids love fresh berries. They will enjoy stirring and mixing the dressing ingredients in this recipe and watching as the color changes to bright pink. Bring the berries, vinegar, honey and water to a boil over medium heat. Reduce the heat to simmer 15 to 20 minutes. Cool. Add salt, mayonnaise, garlic, oil and herbs. Mix well. Combine beans, quinoa, onions and greens and dress lightly. Top with crumbled feta.